The Achilles and calf are both important sources of performance as well as sources of frustration. Various research has demonstrated an incidence rate of 10 to 20 % for Achilles tendinopathy depending on race distance (Lopes et al., 2012; Middlelkoop et al., 2007). Many runners will not need research to tell you how irritating injuries in this area can be, including 5k and 10k world record holder Kenenisa Bekele who struggled with this issue for quite some time. The Achilles and calf complex are actually made of multiple muscles that connect into the Achilles tendon. Everyone knows the gastrocnemius as the big calf muscle, which is actually made of two somewhat separate medial and lateral heads. This muscle crosses both the ankle and knee joints, so it functions to both plantarflex the ankle and flex the knee. Thus it tends to be most active later in stance phase as the knee straightens and assists during terminal stance to both push off via the ankle and start swing phase with knee flexion (although there are many other muscles that do a far better job of knee flexion than that). 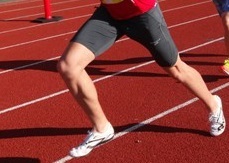 The soleus is the deeper muscle of the calf complex that is often overlooked (but should not be). This muscle only crosses the ankle joint and thus is a primary ankle plantarflexor. The soleus is active far earlier in stance phase than the gastrocnemius and is especially active when the knee is flexed (as opposed to straight with the gastroc). Finally we have the plantaris (not pictured above) which is a tiny thin muscle that weakly contributes to the gastrocsoleus muscle complex. Other than potentially being there for proprioception, little is known about the true function of the plantaris (other than being a pain trying to differentially diagnose from other injuries in that area). All these muscles connect in some manner into the Achilles tendon, which happens to be one of the thickest tendons in the body. The tendon inserts into the middle posterior calcaneus (heel bone) and has several bursae close to it to reduce friction between the many structures in that area. Now how does all this apply to runners? Well as we know the calf complex is important to help with propelling the body forward during the propulsive phase of gait. 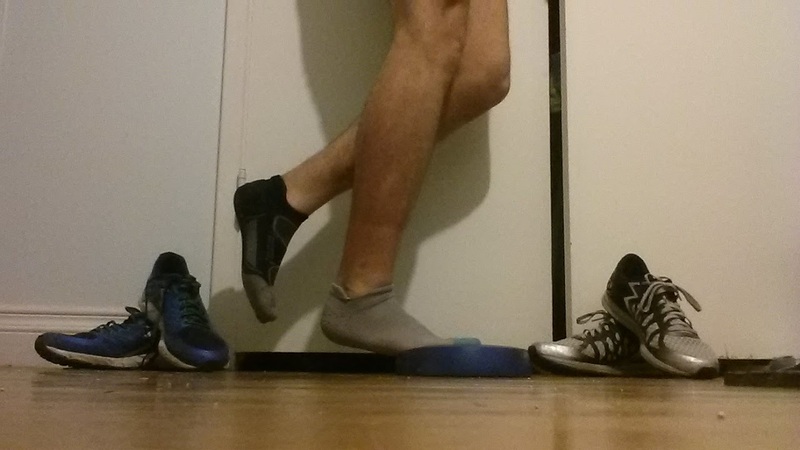 What most do not seem to realize is that the calf muscles are also very important for shock absorption. For those that land on their forefoot or midfoot, there is a higher loading rate not just during initial contact (as that is the main shock absorbing muscle with that type of footstrike) but also overall through midstance as the body passes over the foot (Almonroeder et al., 2013). So a forefoot/midfoot striker has a prolonged eccentric loading phase for the achilles complex. This is not a bad thing, just something to be aware of. Different footstrikes load different areas and have different risks associated with them. Regardless of initial contact, the calf complex also begins to be heavily loaded eccentrically during midstance as it resists further dorsiflexion then gives a quick concentric contraction as the foot passes under the body to assist with forward propulsion. So what does that mean? That means regardless of where you land first, the soleus is being loaded eccentrically during midstance and the gastrocnemius functions more during terminal stance and toe-off. Additionally if you forefoot strike, the eccentric loading phase for the soleus begins at initial contact instead of midstance. So that poor soleus takes quite a beating, especially since the most muscle damage and the highest risk of muscle tears occur with eccentric exercise. These are some of the best we have for tendinosis and tendinitis (after the immediate acute phase) especially of the Achilles. Eccentric exercise has the highest load compared to isometrics or concentrics. 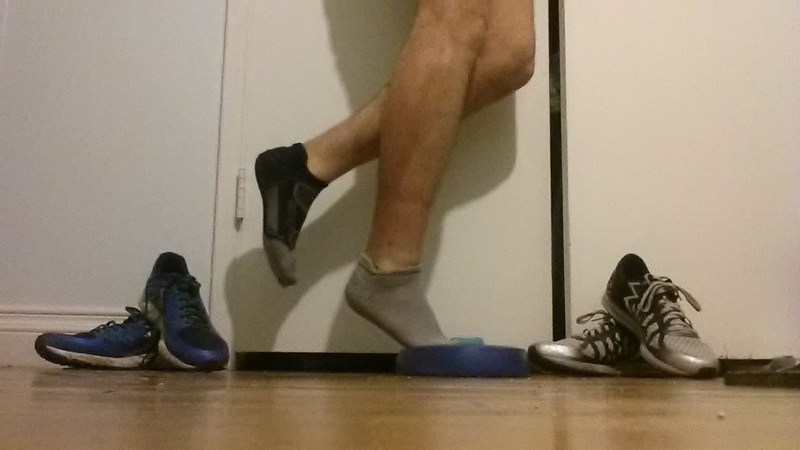 So it is a great way to prep the soleus for the job it has to do. 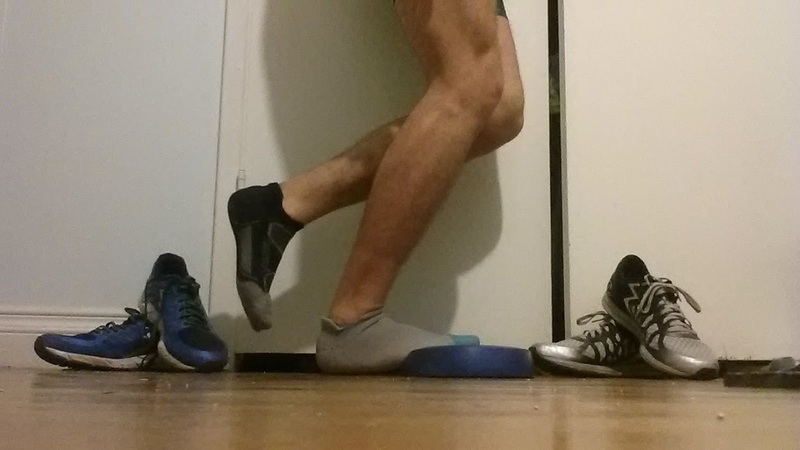 I personally prefer bent leg heel drops rather than traditional straight leg heel drops as they isolate the soleus muscle better (although the soleus will also be active during straight leg calf work). I tend to find more soleus based issues than gastrocnemius in the longer distance running crowd. Per clinical practice guidelines and quite a bit of research out there, eccentric training is one of the best ways to manage achilles tendinosis as eccentric exercise seems to help with tendon remodeling and healing (Carcia et al., 2010). Tendinosis is the chronic version of tendinitis, whereby the tendon becomes chronically injured and the normal phases of healing go awry due to continued load and the inability of the tendon to fully heal. Eccentric training seems to help reset that due to the extremely high controlled load (the research is still out on the exact mechanisms). (Disclaimer: When rehabbing an Achilles tendon, anecdotally I have found it best to utilize both straight and bent knee heel drops despite preferring bent knee). Given that the gastrocnemius is most active as a plantarflexor during terminal stance with the knee straight, this muscle can be trained best with straight leg calf raises. If this is the source of your issue, eccentric straight leg drops are great. If you are just trying to strengthen, focus on normal straight leg heel raises to help train this important terminal stance muscle. The gastrocsoleus complex works best on a stable surface like any large muscle group. If you are running on an unstable and weak ankle, instead of focusing on propulsion, the calf will spend extra time loading AND trying to stabilize. The gastrocsoleus is supposed to be a sagittal plane muscle, not frontal or transverse plane. Many injuries occur when muscle groups have to compensate in ways they are not supposed to. 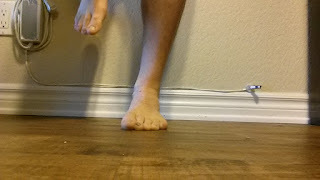 Thus if your calf has to compensate because you have a weak posterior tibialis (which is a weak plantarflexor but supposed to be stronger invertor) or fibular muscles, your calf is doing extra work on top of what it needs to be doing. This is a great way to burn out a muscle, or in clinical terms lead to a tendinitis, tendinosis/opathy (long term) or muscle tears. So make sure the base is stable. That includes strengthening the posterior tibialis, anterior tibialis, fibularis longus, brevis and tertius and the intrinsic foot muscles. I have previously written a post on the ankle stabilizers that can be found HERE. Given that the gluteal muscles are also loading and propulsive muscles during the stance phases of gait, it is important to have those strong to prevent Achilles or calf issues. Why? The gluteal muscles are especially active during the loading phase of gait and midstance to help first absorb forces then begin the transition into the propulsive phase of midstance (Noakes 2003; Perry 1992). If the gluteals are weak, the calves are one of the many muscle groups that will take up the extra shock absorption and propulsion generation duties. As I have stated many times, injury prevention is about balance (sometimes literally as I mention briefly in the next section) in the body. Every muscle group has a purpose and when they fail to perform that, something else has to work twice as hard to overcompensate. That overcompensation and thus overworking of a muscle is a great way to injure it. I have written a post on gluteal and hip strengthening and it can be found HERE. As I mentioned with in the ankle stabilizer section, the calf works best on a stable base. While strength of the stabilizers is important, so is working on the neuromuscular component of balance. That involves both practicing coordinating the muscles of the ankle and foot to stabilize this area, but also your proprioceptive sense. Proprioception is the fancy term for how the body knows where each part is in space relative to everything else. Having a better idea of that means your body picks up where you are or are about to land on the ground, thus can neurologically kick on your ankle stabilizers faster or better. Thus I recommend people practice single leg balance both with eyes open (all senses are active) and eyes closed. With eyes closed, your somatosensory sense (direct sense from the nerves in your joints and muscles regarding where your foot is) is emphasized. This sense is particularly important when your vestibular and visual senses are preoccupied (the other two major proprioceptive senses), like when you are on a windy trail run. Your eyes are figuring out where that next tree is, your inner ear is dealing with the undulating changes in the terrain and thus the position of your head. So that leaves one last sense to help you land with each foot step! Now you might understand what may have contributed to that rolled ankle on the trail run last week! 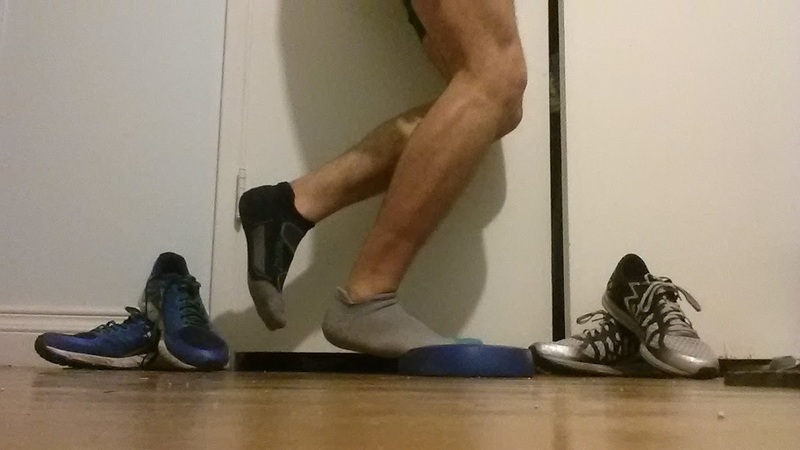 Plus running is a series of single leg balance. So you should practice that! (I will have a future post on balance). Achilles injuries can be both simple and extremely complicated. Further issues that should also be addressed include training volume (balance is important, not too much and not too little), cross training, worn out footwear and stretching. So while the above are important exercise and strength considerations for prevention, you have to think about the larger picture as to why these occur. Your achilles and calf muscles are powerful friends if utilized correctly, so make sure to take care of them. Prevention here is key and in addition to performing the above calf exercises, balancing your body and ensuring that everything is working properly is a great way to work towards keeping yourself healthy.